With a little creativity, you can take a baked sweet potato from uninspired side dish to a filling meatless meal. Yes, a potato as a meal! Not a big, oh-I’m-so-stuffed-I-can’t-eat-another-bite type of meal, but a light, healthy meal. The kind of meal that comes in handy when someone brings cupcakes to work and you make yourself sick on frosting or when it rains on Halloween and it would be a shame to let all those Twix bars you bought go to waste, so you have no choice but to eat them yourself. It’s all about balance, right? You’ll want to start with a big sweet potato–not super big, but big enough to make a satisfying dinner (or lunch). Pierce it with a fork, bake it at 400º until it’s tender (this usually takes about an hour, although it depends on the size and shape of your potato), and then add a topping or two. While your sweet potato is baking in the oven, whip up a batch of sautéed maple apples and toast some pecan pieces. Stuff your potato full of that nutty apple deliciousness! These potatoes would make a great fall breakfast too. You know those packets of Indian entrees that you can microwave or boil in water? I love those on a sweet potato. I used Tasty Bite channa masala on this one and sprinkled a little cilantro on top. If you have leftover chili or even Thai curries, those also work well as a sweet potato topping. Salsa beans! Take some cooked (or canned) black beans, simmer them in a little bit of salsa until they’re warmed through, then spoon them onto your baked sweet potato. Top with queso fresco or shredded jack cheese and cilantro leaves. 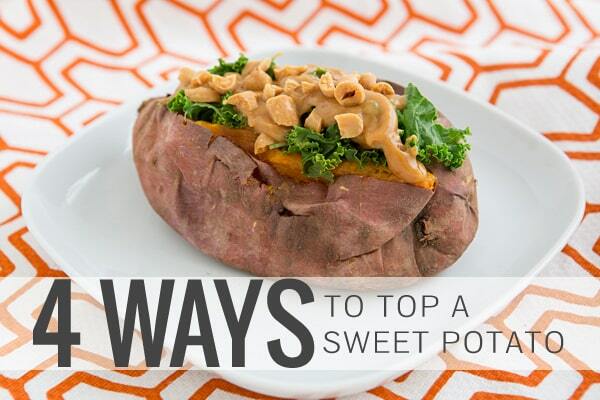 This is probably my favorite way to top a sweet potato. And I know it sounds a little crazy, but you’re just going to have to trust me! Steam some kale until it’s wilted, then stuff it into your sweet potato. Top it with peanut sauce (homemade or store-bought) and chopped roasted peanuts. 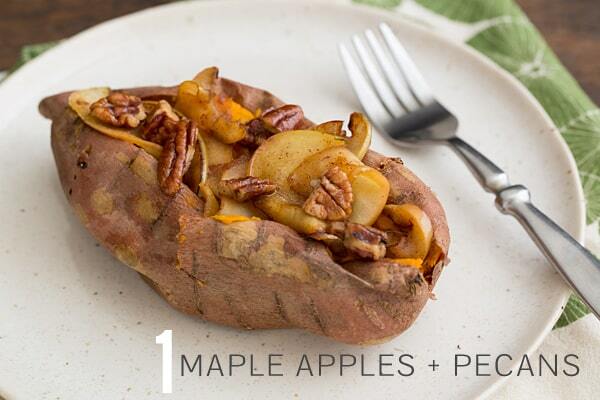 What’s your favorite way to top a sweet potato? I choose…………all four! haha. No really, the apple and pecan one looks sooo amazing! I’m all about stuffing sweet potatoes right now and you just gave me more scrumptious ideas! I could eat peanut sauce on anything so why have I never thought to combine it with sweet potatoes? Now I will, thanks! Yum! These all look so tasty. The sweet apple and kale/peanut sauce look especially good to me. I haven’t had a baked sweet potato in a while, although I did have just have a white one. I went through a phase of eating them for breakfast every day with a spoonful of almond butter and a drizzle of maple. Delicious. Ooh, I love the idea of adding almond butter! Made the apple & pecan topped sweet potato this morning. Added a few raisins too. Definitely a breakfast of champions! Love these meatless ideas for topping sweet potatoes – genius! They all look so delicious! Yummo Kierstan! My husband travels quite often for work, so I’ll definitely pulling these ideas out on my dinner for one nights! I absolutely ADORE this post. It’s so chock full of creative and beyond delish ideas! 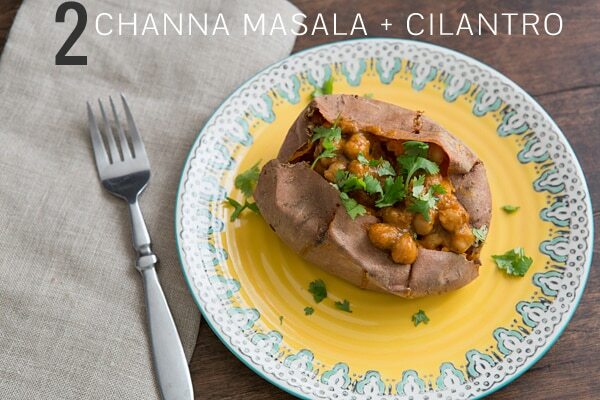 I love Tatsy Bite’s channa masala but I’ve never thought of stuffing it in a sweet tater. And the apple pecan idea?? Helloooo heaven! The channa masala (or really any of those Indian curries!) is good on white potatoes too. 🙂 These are the things I learned in college. Love them! Kale and peanut sauce is my favourite! I’ve never had one of those packets of Indian food, but I want to try that potato! I’m having hard time to pick up one! I’ll buy sweet potato and try the last two first. Peanut sauce and kale is intriguing! I traditionally top mine with cinnamon and butter but I often eat ONLY a sweet potato for a meal so these are definitely something I will try to change it up a bit. OOh yes to chana masala! Great post idea! Sweet potatoes + peanut sauce are one of my favourite combinations, but I also love the looks of that apple version and the idea of eating it for breakfast! I love these ideas! Especially the kale and peanut sauce and chana masala. I often get those packets at the grocery store when I’m eating dinner alone, and I can only imagine how much better they would taste stuffed into a sweet potato! Thanks for the great idea. 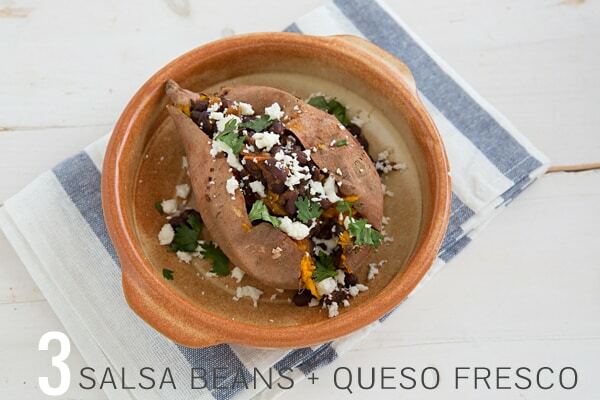 I can’t wait to try out the salsa beans and queso fresco recipe! I’ve definitely been in a baked potato rut. I am all about making sweet potatoes the focus of a meal. I need to try the steamed kale and peanut sauce recipe! 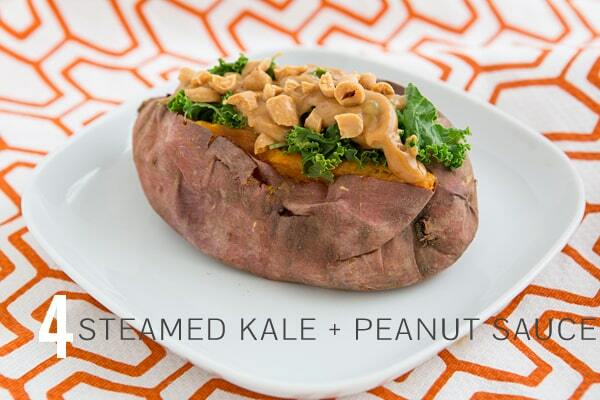 The sweet potato with kale and peanut sauce looks amazing! All my favorite foods in one meal!